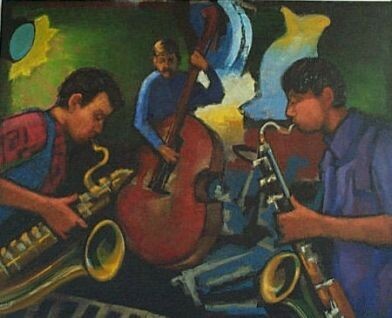 I wanted to paint large versions of some of my favorite original jazz paintings. I found linen with a very heavy weave, almost as coarse as burlap, to paint on. It gave a smokey, broken texture to the surface--a good imitation of the lighting in jazz clubs.